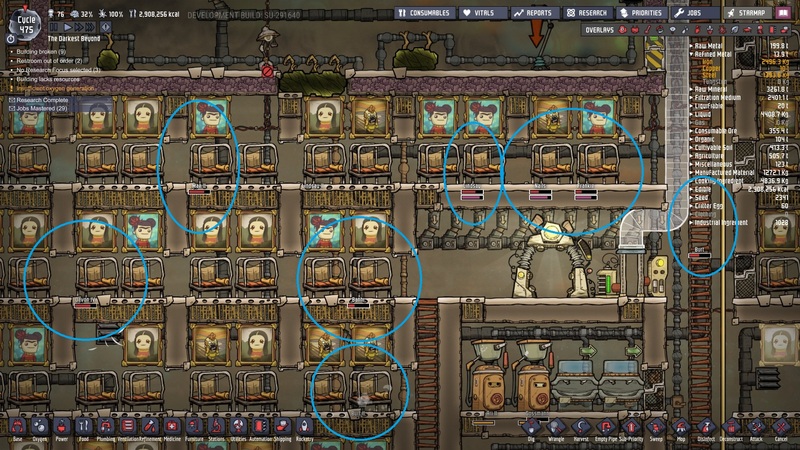 I decided to keep playing after one of my duplicants died; normally I reload and rescue them. Just after she died, the rest of the duplicants became stuck running or climbing in place. They would still respond to move commands and navigation was fine. Based on my experience with the game, I believe they were stuck in a "finding path loop" - where they're running or climbing to get somewhere but are calculating how to get there. I've haven't seen this behavior recently, so it's not due to my hardware or having too many paths. So I said, let me reload and see if the issue remains. Well the issue remained and also got worse. My duplicants don't move AND disappeared. I can get them to reappear and move if I force them using the move command/button, but then they just keep running in place where I told them to move to. They move to get oxygen if they are out of breath, to use the bathroom, and to eat and sleep, or to mourn. Once they mourn, they resume normal duties. So, is it intended that duplicants perform no tasks until they mourn? This can take a while for large bases: 76/2*10 = 380 seconds (approx 6 minutes). If it is intended, then the scope of this bug report is that the duplicants do not appear after loading a save game and when they are mourning, or get stuck in the running/climbing animation if visible. There was a bug that caused dupes to freeze if they were unable to reach a memorial to mourn. In your base specifically, the problem seems to be that the space to the right side of the memorial is blocked and dupes were unable to stand there.